The Holm v. Baty Exchange 02/04/2018 – Kent Hovind v. Robert Baty – The Great Debates! Dealing with the false image system that has kidnapped and or stolen your baby, is like dealing with a foreign country that functions under the rule of Satan where they use false abstract laws and policies that exist NO WHERE in Creation and or Nature. The only real answer is to expose their false image system and false codes as the false god, for anything past the root of the problem shall only entertain the game of Satan where the game is rigged in their favor. Win the battle within the mind of the alter ego false image false god and we stop all wars within reality. Letters numbers symbols and geometry exists NOWHERE in Creation and are fictitious codes to quantify existence. Any and all things that exist from false codes is of the false god and is the false image of Creation and or Nature. Expose the Satan virus and we save the core of existence, FAMILY. Baby Holm was not kidnapped or stolen as is supposed. What it was is explained in the interview with Joseph Edward as linked below. Everyone can have an opinion but the facts and evidence is what shows the truth. Our baby was kidnapped and stolen under deception and fraud. Anyone who speaks like Robert Baty without facts and evidence of truth is a con artist that is only using misdirection tactics. When someone shows stalker mentality like Robert Baty they have a serious problem with their own denial system and have evil reflections from within that they must try and fill the void by atttacking the innocents of others for a high. Lots of lies from Robert, You kicked me out of your group when I was giving facts and evidence. You said in your interview that I left the group. Baty is a professional liar for the Government. Before we entertain Satan lets get past the root of the problem which is, that letters numbers symbols and geometry exists No Where in Creation and or Nature and are a fictious process of the rational mind ego creating false patterns to quantify existence to then become one with spirit. Therefore any and all systems that have been created by these false patterns are of the false image of Satan. We dont want to be a virus of Satan, How does the false codes of Satan apply to our family? OK, let’s see if we can put your position in to plain English, Christian. justified in taking Baby Holm in October of 2016. You, C. Clarke, indicate you simply do not believe the law was applicable to you and your situation. If that’s not your position, please explain. Otherwise, considering what you have ranted about for over a year now, please explain what it is about the law that you don’t think is applicable to your situation, if the law was applicable. Solve the root of the problem first, for to go past the root of the problem is to only entertain ones own insanity. You are welcome to your ranting about the “root” problem. We disagree on that and it doesn’t really matter. What matters is the custody issue regarding Baby Holm. I note, for the record, you have nothing to rebut my claims regarding the applicable facts and law. Let me know should you have anything to offer on those “root” issues for my consideration. Note to the record that Robert Baty has no facts and or evidence to get past the root of the problem and therefore any and all things said by Robert Baty is null and void due to insanity. The “facts” are not in dispute. You just don’t want to face them in light of the law which you have been falsely representing for over a year in addition to claiming you are not amenable to it. One someone steps up to discuss that, openly and honestly, we can attempt to advance that discussion. Where is the facts and evidence that the court system is not of Satan? Where is the facts and evidence that the court room is of the one law of the Creator, substance LOVE? C. Clarke can’t do it. Susan Cobb can’t do it. The “facts and evidence” that they can’t handle do just as I have proposed; justify the taking of Baby Holm in October 2016. You have questions to answer Robert Baty. We can deal with questions as they might become relevant. For now, I have found no worthy opponent. If you wish to step up, C. Clarke, and have a reasoned and reasonable exchange on the matter, let me know. What is relevant here is the good and evil. This entire system is a lie that is indoctrinating everyone into satanism. The State Of Alabama used fictious codes and policies that are of the false image system of Satan and are not of the Creator. We have facts and evidence of the one law of substance LOVE and that the world has been converted into a possession and is owned and operated with property lines. If one has the choice to Fall from Creation then one has the Choice to Rise back to the Creator. If the system in place today is of the fall, then where is the remedy to rise? One can not just impose fictitious laws that do not exist within Creation and or Nature, unless one is acting under the false god Satan. So, you, C. Clarke, further admit to not being up the discussion I have proposed and further admit, as I previously suggested, that you reject the notion that you are amenable to Alabama Code Section 12-15-306 which I provided to you earlier as the legal standard applicable to the taking of Baby Holm in October of 2016. It’s one thing to claim the law is not for you, C. Clarke, but it is quite another thing to falsely represent the law as you have been doing over the last 15 months. Here’s a question for you, C. Clarke. Can you confirm that termination of your parental rights to Baby Holm occurred this last week; as far as the lower court is concerned? Robert this has become a one sided conversation that has no substance Love. You must answer the questions and be apart of the conversation, for to go past the root of the problem and only ask questions and give no answers is only a recipe for disaster. Answer the questions Robert? Obviously, C. Clarke, if you are not man enough to openly and honestly engage me, or even attempt to negotiate for the production of an exchange regarding the fundamental issues in your custody case, we aren’t going to have a proper exchange. As for me, I prefer that, in such cases, there be no questions. I can either make my case, or not. You can either rebut it, or not. I and my position remains without a worthy adversary. You, C. Clarke, have seemed to have taken yourself out of that matter. The State retains custody of Baby Holm and YOU GOT NUTHIN’ that would change that. Let me know if you find anyone who might do what you cannot; engage me in the production of the proposed exchange. One who does little or nothing to reasonably satisfy the State of Alabama that he/she is willing and able to provide for the reasonable and basic needs of a newborn will be deprived of custody of such newborn. My invitation to discuss that matter remains outstanding. Its already been testified on the stand by multiple people including a sheriff detective that there was no emergency and we had all necessary provisions at the kidnapping. There you go again, C. Clarke. Have you even read the law I have given you at least twice today (three time counting this one). You have been misrepresenting it from the beginning. We could deal with that if you would get serious about setting up a proper exchange of that matter. Of course, you have already stated it didn’t matter what the law was. You think you can invoke some “odd belief” of yours and declare you are exempt from the law. P.S. – Perhaps, if you are serious about that, you can direct me to the link and quotes, in context, of whatever it was that alleged detective said. The facts, independent of any such testimony, indicate you did not have “all necessary provisions”. no alcohol=proven, no drugs= proven, no abuse=proven, no neglect= proven (as it was testified he had clothes, food, medical care, shelter AND TRANSPORTATION (which you lied about among many other things in your interview) no emergency=proven (testified by detective on stand, and hospital security), no “laws” broken by us= proven. Many laws broken by them=proven, constitutional violations broken by them=proven . Our child came out of my sperm into the egg of my wife to create a human child with the Creator by the will of the Creator= proven. Our child was stolen by force and fraud, under deception and false accusations acted on against us, not by us=proven. There are perpetrators of crime in this situation and we are not them, nor is our baby. Our family has been maliciously assaulted and violated more than once and on a continuous basis=proven. And no, Danielle is not pregnant nor are we living in Texas=proven. Stop lying. Bring your witness in to this discussion and I will cross-examine him about whatever he might have said and whatever he might have known about such matters. Otherwise, I call ipse dixit and renew my request for a link, quotes, a way to find that testimony you are relying upon. I think you are lying about the facts of your case, independent of your supposed witness. Your saying it fails to meet the legal standard applicable, even if it is true. You are still failing to exhibit an understanding of Alabama Code Section 12-15-306 and its application to your case. Yes, do tell us more about your Boerne, Tx sojourn and where you are now. I didn’t lie about that. Lying is what you and Danielle have been doing for over a year now, but we can work around that issue if you are willing to work with me to produce a proper exchange. It was the States witness that gave that testimony. Do you know how many false abstract laws that exist within this country alone? Over 80 million and counting to infinite. Therefore, how does any of these false abstract laws created upon the artificial backwards foundation of Satan apply to my family that is of the Creator and the one law of substance Love? Hey, if you think whatever that witness had to say is relevant, bring me the link, quotes and I will either accept it or explain why it doesn’t do what you think it does for your case. Your failure to provide such information, so far, is an indication that it doesn’t do what you would like to claim and that you know it doesn’t. And there you go again, C. Clarke, setting up your default “the law doesn’t apply to me anyway” option; which has only, in part, guaranteed the State would be justified in retaining custody and terminating your parental rights. What has been evidenced is a rogue operation where the State doesnt even follow there own laws and also violate the Creators law. A world without God, is a world of organized chaos. I don’t believe you, C. Clarke. In any case, your latest statements are a further implicit admission that YOU GOT NUTHIN’ to refute my factual and legal claims justifying the taking of Baby Holm by the State of Alabama in October of 2016. Power of persuasion does not get past the root of the problem. I love you brother. Power of persuasion is what got Baby Holm taken in to State custody and you and Danielle were the ones who were so persuasive and you’ve worked hard for over a year to make sure the Court was never convinced to change custody back to you and Danielle. You and Danielle are the “root of the problem” as to the custody dispute regarding Baby Holm. You persuaded the State to take custody and have been persuading the case ever since to retain custody and terminate parental rights. The State used deception and fraud and violence to kidnap our baby given to us by the Creator with no justifiable reasons. If there is no injury and or harm, there is no reason to invade anyones family, for to invade without injury and or harm is to only enforce a system that has become separate from the Creator as a false god. You are the one lying again, C. Clarke. You don’t get to make up the laws applicable to your situation, and you again fail to demonstrate your reading and comprehension and understanding of the application of Alabama Code Section 12-15-306. If you had worked with me, or will, to have a proper exchange, I will be glad to work through that with you; step by reasonable step. That is evidence of codes from the State of Alabama. Now, where is evidence that the codes from the State Of Alabama apply to my family that is of the one law of substance Love? We can deal with that if we set up a proper format and actually produce the exchange I have proposed. I’ll give you a short, simple, straightforward, layman’s answer. The Court has considered your complaint about jurisdiction, and you lost. The best evidence, from a layman’s standpoint, is that the State of Alabama has had custody for over a year and may have just terminated your parental rights. You have provided no legitimate basis for contesting the State’s jurisdiction. Your “odd beliefs” just don’t cut it. Jurisdiction means nothing when the codes cant even be proven to apply. This is very simple. The government has gone rogue against people. It can be shown, was shown, and you have done nothing to overcome that ruling. This is very simple, C. Clarke Holm, it doesn’t matter what your “odd beliefs” are about such things. “We the people” have a way of resolving those disputes, and have, and you lost. It was proven that the State committed fraud and kidnapped our baby. False charges to open the case. They lied to the computer system to open case. Any false charges were the result of your antics, and they were resolved without affecting the custody issues because the State was otherwise justified in taking Baby Holm. Such antics are of no avail to you C. Clarke. You just got it all wrong. If you were more reasonable and would work with me work through the proposed discussion regarding the taking of Baby Holm in October 2016, you just might see that. So far, you have persuaded just about everyone that “you can’t handle the truth”. No emergency, no injury and no harm. They lied to open the case. You can argue with the facts and evidence all you want to but you are only furthering your own insanity and im not going to assist you with that any longer. I love you brother. I am not the one kicking against the pricks, C. Clarke Holm. I stand as always, prepared to present the “facts and evidence(law)” relevant to justifying the State of Alabama taking custody of Baby Holm in October of 2016. “Emergency, injury, or harm” was not required to justify the taking. I’ve been giving you the legal reference repeatedly and you have continued to refuse to face it and deal with it. Your references do not do what you would like. If you are through with me, let me know and we can conclude our discussion. Thanks for the demonstrations, C. Clarke/Danielle. You have only given facts of the states codes and no facts of how they apply. What stops One state from invading another state with those codes? You have blasted away with a “100” issues that might be of some interest, C. Clarke. The fundamental/root issue has to do with the taking of Baby Holm in October of 2016, and I stand prepared to offer up the justification for the State’s action, legally and factually, if I ever get a worthy opponent. You have made clear you are not up to that production, C. Clarke. If you get serious and want to pursue that discussion, step by reasonable step, let me know and we can work out the logistical details to make such an exchange most profitable as possible. The root issue is that the world has turned from God and Satan has taken rule of this planet by perverting man and woman against God by Creating a artificial backwards foundation over the forwards organic ground of Creation where organized chaos is used as a weapon to create false abstract laws for profit to self enrich the evil ones that enforce it and stand with it. The only thing that matters is the living body of earth, for the forwards organic ground is what gives us life. Any other system that uses letters numbers symbols and geometry against Creation is only a system that has become a virus of false codes that is destroying Creation and or Nature. The root issue is not as you suppose except as it relates to your own “odd” purposes which do not include having custody of Baby Holm returned to you. Thanks for the added admission that the custody of Baby Holm is not something you ever wanted to be returned to you. I got you beat on the custody issue, and you know it. I got you beat on the theology as well, but I don’t care to quibble over that. The competitive mind is a insane mind, for at the moment one must be competitive, one must be selfish to carry out the act. Thank you for proving that in this conversation. The people need to understand what selfishness really is and how Satan can influence our minds as we are blind and bound under the alter ego of false patterns that do not even exist within Creation and or Nature. Nature does not need letters numbers symbols and geometry to exist, it is only the artificial reality of the false image of Satan that absolutely must have these false patterns to exist. We are not letters numbers symbols and geometry that fills the machine with artificial anti life. We are the emotional thoughts of energy that fills the body with organic life. We are substance LOVE. Our baby was kidnapped by humans under the influence of Satan. How many times, C. Clarke/Danielle, do you have to be told that your “odd beliefs” are not relevant to the custody issue! That’s pretty much standard for the “losers”. You gave up custody of Baby Holm. You have acted consistent with not wanting that to change. If you want to get serious with me and discuss the “root” custody issue, I will try to make myself available and we can work out the logistical details to make such a discussion profitable to all. What facts do you have Robert Baty that the State of Alabama is God and that their custody laws apply? God is not in the proposition, and if you want to get in to that later, when we might have a mutual interest in doing so, I would propose that God is not with you in this matter, C. Clarke/Danielle. God is with me, and my efforts to compete for the welfare of Baby Holm have been successful because of that. You, C. Clarke/Danielle, and yours, have stiffneckedly refused to heed the message God has sent me to deliver to you. Justified by who, the State? The State that kidnapped him? Or is it the next state over? Or is it the next country over? Sit back and watch and learn of such things, C. Clarke/Danielle, if you ever find anyone willing to take up your position and oppose me and the proposition offered for discussion. Answer the questions and stop dancing for the Devil. As for me and my house, we stand with the LORD. Come out, C. Clarke/Danielle, or send me your Champion, so that we might have a reasonable and reasoned discussion of the proposition whereby I set for the justification for the State, factually and legally, taking custody of Baby Holm in October of 2016; and either accept the rebuttal or explain why it fails. Look in the mirror, C. Clarke/Danielle. That’s the Devil himself sitting on your shoulder. “Come let us reason together”, or not! There is no reasoning with one that dances for the Devil and will not answer root questions that expose the Devil. We can only hope to grow together brother with truth. The Creator does not condone the theft of children, thou shalt not steal. It is only the father of lies with false codes that steals children for profit. There may be no reasoning with and your Devil, C. Clarke/Danielle, but my God has sent me so that you will at least hear the truth. Be careful of the increasing intensity of the coals of fire you are bringing upon your own head. Baby Holm was rescued, not stolen, not kidnapped. Life is risky in any case, but the facts and evidence suggest, with God’s blessing, that Baby Holm is better off somewhere other than with parents who have worked so hard to keep from having to be parents. The facts show that your discernment is wrong and that you choose to follow and stand for a system that has no substance and therefore is a false god. No they don’t, and you, C. Clarke/Danielle, have shown you have no desire to test that claim by having a proper, reasonable discussion of the proposition set forth. Prove you dont serve the Devil. If there is interest in pursuing a further discussion of matters of mutual interest once you or your champion faces me and deals openly and honestly with resolving my claim that the State of Alabama was justified, legally and factually, in taking custody of Baby Holm in October 2016, then we can add that to our list of additional issues to pursue. I think, however, your Devil issue would be moot if we first asked for your proof that you “serve the living God” (a claim I would deny to your affirmation). I am the emotional thoughts of energy that fills the body with life. I am of substance LOVE that gives the patterns within nature life. I expose the false image of Satan, which is the false patterns and false substance of anti life. Therefore i am of the Creator as the Creator is of me. Saying it doesn’t make it so, and you are not as you claim. I am using a computer of anti life which is of the Devil to expose the Devil from within the false image of the Devil, the only difference is that im not in denial of it. That’s not what you are doing. Thats right. Its what we are doing together brother. Let me know if you or your champion gets ready to get serious about a discussion of my claim that the State of Alabama was legally and factually justified in taking custody of Baby Holm in October of 2016. Do you think Premise #1 is true? Do you think Premise #2 is true? 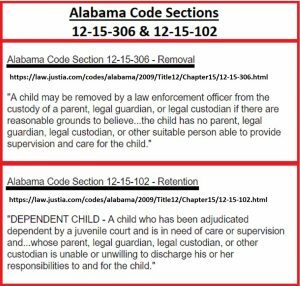 Alabama Code Section 12-15-306 is the law in Alabama and provides for the taking of a child where there is a reasonable belief that there is no one available, willing and able to provide for the basic needs of a child and was/is applicable to the Baby Holm case. The parents’ known residence was a tent. area in or near a state park. The parents identity issues were not resolved. walk out of the hospital with him. The parents’ financial resources were unknown. 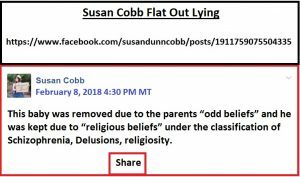 The parents otherwise exhibited “odd beliefs”. They were not/are not amenable to Alabama law. the taking of Baby Holm was UNjustified.